Editor’s Note: Below is Part 2 in our two-part series on restoring thyroid health. As we learned in Part I of the series (which we encourage you to read before moving on to the post below) — Restoring Thyroid Health: Part 1: Hypothyroid — Just shy of 15 percent of the U.S. population is expected to develop a thyroid condition at some point, while roughly 20 million people in the U.S. have a form of thyroid disease, and 60 percent of those people with thyroid disease are actually unaware of their condition. In this part, the focus shifts to diagnosing and treating hyperthyroid (overactive thyroid). Clinical manifestations of hyperthyroid include heart arrhythmia, rapid pulse, elevated thyroid hormones (see the next section), bulging eyes, and softening of the nail beds. Most of the patients who come to our office with hyperthyroid have already been diagnosed as having it. Diagnosis typically involves measuring the levels of thyroid stimulating hormone (TSH) and the thyroid hormones Triiodothyronine (T3) and Thyroxine (T4). As explained in Part 1 of this series, normally, when T3 or T4 is low, the pituitary gland releases TSH to signal the thyroid to release more thyroid hormone into the system. With hyperthyroid, TSH is typically low and T3 and/or T4 are high, indicating that the thyroid is releasing T3 and T4 without having been signaled to do so. Conventional hyperthyroid treatment involves the use of anti-thyroid medications (methimazole and propylthiouracil), radioactive iodine ablation (destruction) of the thyroid gland, or thyroidectomy (surgical removal of the thyroid gland). The choice of treatment depends on the diagnosis, any contraindications to a particular treatment, the severity of the condition, and what the patient prefers. 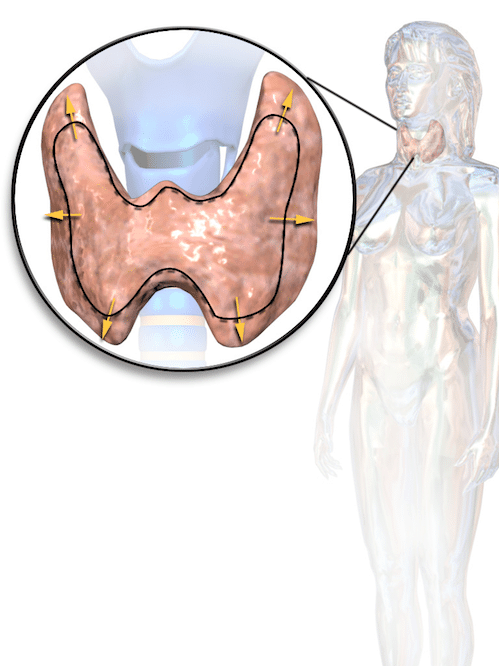 In the U.S., radioactive iodine ablation is the most widely used hyperthyroid treatment. Although removing or shutting down the thyroid may be necessary, the result is hypothyroid (see Part 1 of this series). The patient must then take thyroid medication because the body can no longer produce the T3 and T4 necessary to control metabolism. In other words, conventional treatments typically transform a hyperthyroid patient into a hypothyroid patient. Nodules or a goiter that develops in the thyroid gland causing excess secretion of thyroid hormone in the nodules or goiter. Grave’s disease — an autoimmune disorder in which the immune system produces antibodies that bind to receptors on the surface of thyroid cells and stimulate those cells to produce thyroid hormones. In other words, the antibodies act as TSH, signaling the thyroid to produce more thyroid hormone even when it is not needed. Taking too much thyroid hormone, which causes a transient hyperthyroid state that is corrected when the medicine is reduced. Supporting a balanced immune response: Because the underlying cause of hyperthyroid is often autoimmunity, restoring health to a dysfunctional immune system is a key step to restoring thyroid health and function. Even if a patient has had a thyroidectomy or radioactive iodine ablation, the underlying autoimmune condition must be diagnosed and treated to prevent further deterioration of health and improve the patient’s quality of life. Monitoring for iodine excess or deficiency: Too much iodine may result in a temporary overproduction of thyroid hormone. An iodine deficiency can result in the formation of nodules or goiters that ultimately leads to hyperthyroid. Identifying and addressing environmental triggers that could be aggravating a person’s thyroid: Several factors can aggravate a person’s thyroid, including environmental toxins, diet (such as refined foods and excessive sugar consumption), poor stress management, insufficient or restless sleep, and other lifestyle factors. Because functional medicine focuses on restoring thyroid health and function instead of merely eliminating the direct cause of symptoms, our approach at BioDesign Wellness to diagnosing and treating thyroid dysfunction is similar regardless of whether a patient is in a hypothyroid or hyperthyroid state. Conduct a physical examination and carefully review the patient’s history. The physical exam and patient history often reveal factors that may be aggravating the thyroid or have done so in the past. Order tests for underlying cause(s) of thyroid dysfunctions, such as small intestinal bacterial overgrowth (SIBO), Epstein-Barr virus (EBV), Lyme disease, chronic mold exposure, and hormonal changes. These tests will vary considerably based on the initial evaluation. Perform a sonogram of the thyroid. A sonogram can help to identify whether the thyroid is inflamed, nodular, or has shrunk. Urinary excretion testing for iodine sufficiency. Restore healthy balance of gut microbes and repair leaky gut. Support with appropriate thyroid hormones, which is necessary for any patients who have received treatment for hyperthyroid that results in a hypothyroid condition. Whether or not you have a thyroid condition (hypothyroid or hyperthyroid), we encourage you to visit a doctor trained in functional medicine for a complete health evaluation and to identify any underlying conditions that could threaten the health and function of your thyroid. Like many others, you could be living with these underlying conditions for many years without being aware of them. Early identification and treatment preserve the health of the thyroid, helping you avoid any major medical interventions in the future. Healthy thyroid function is a key factor in optimal health and fitness. Disclaimer:The information in this blog post on hyperthyroid— the second in a BioDesign Wellness Center series focusing on the thyroid — is provided for general informational purposes only and may not reflect current medical thinking or practices. No information contained in this post should be construed as medical advice from the medical staff at BioDesign Wellness Center, Inc., nor is this post intended to be a substitute for medical counsel on any subject matter. No reader of this post should act or refrain from acting on the basis of any information included in, or accessible through, this post without seeking the appropriate medical advice on the particular facts and circumstances at issue from a licensed medical professional in the recipient’s state, country or other appropriate licensing jurisdiction.